The College has a strict uniform code. 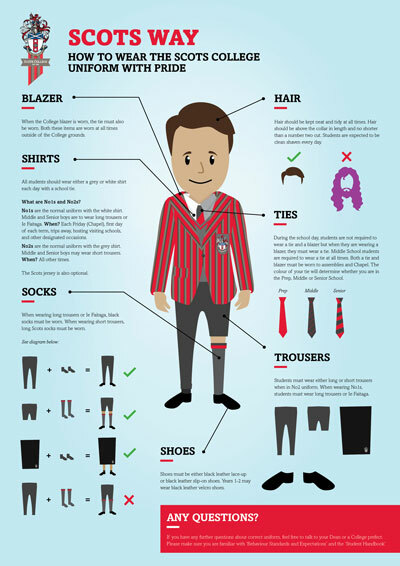 Each day the student wears a jacket, shirt and tie (jersey optional), long or short trousers, socks (appropriate to trousers) and shoes. Number Ones: a white shirt and long trousers or Ie Faitaga (for Middle and Senior School students), short trousers or Ie Faitaga (Prep School students). This style of dress is worn on the first day of each term, on the day of Chapel, for trips away, for hosting visiting schools etc. If a singlet or comparable garment is worn under a shirt, it must be plain white. Number Twos: a grey shirt instead of a white one, and the students may wear either short or long trousers. This style of dress could also be described as “daily dress”. When the College jacket is worn, the tie must also be worn, and both these items are worn at all times outside the College grounds. If a boy is cycling to school he may do so without wearing his College jacket but should have it with him in case it is required during the day (for Chapel, Assembly etc.) Any boy cycling must wear a helmet. 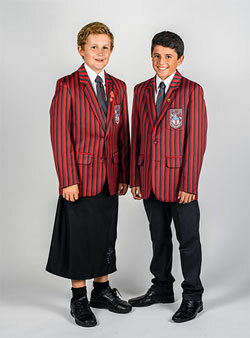 All items of uniform, apart from shoes, are purchased from the College Shop. Stationery can also be purchased by the boys before school and at interval every day. Any outer garment, such as rainwear, must be either black or dark blue. Sportswear for both inter-House and inter-School activities must also be in the school uniform. The below infographic shares information on correct uniform and grooming. The Uniform Shop is a convenient one stop shop for all uniforms, stationery and gifts. For shop hours and to purchase uniform items please read details below. The College Shop is located at Scots College, past the gym. The entrance is off Walden Street. The Uniform Shop is open during the term for students and current families. New students starting at the school are requested to phone the shop to arrange an appointment (ph: 04 3808536) . Snapper and 10 trip train ticket sales close at 1.30pm. Please note: the shop is not open during school holidays. We are now accepting second hand clothing on behalf of parents for resale through the shop. Please read our conditions of sale on our Second hand Clothing Form (82KB) and complete your details prior to dropping off the clothing. At the present time we have limited storage space and can only accept the items listed on our form. Please ensure the clothing is in very good condition otherwise we may refuse to accept it. The uniform shop sells 10 trip train tickets. Please refer to the Transdev Wellington website www.transdevwellington.co.nz for train ticket pricing and conditions of use.